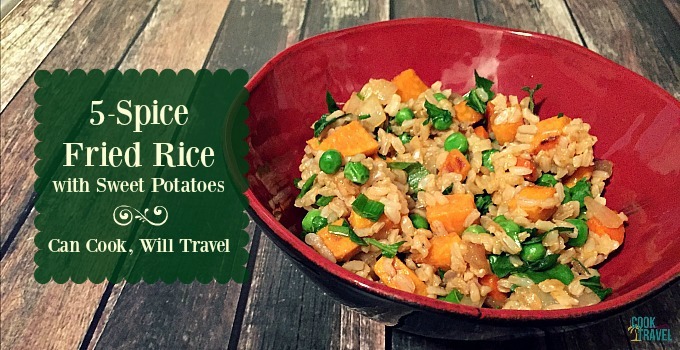 In no time, you’ll be enjoying this 5-Spice Fried Rice! 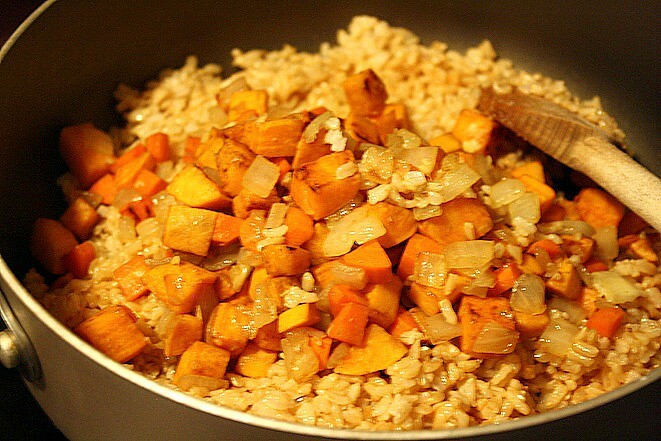 First of all, here’s what you’ll need: Soy Sauce, Grapeseed Oil (or neutral tasting oil like peanut or regular sesame oil), Sriracha, Rice Vinegar, 3/4 to 1 pound of diced Sweet Potatoes, 4 cups of cooked Brown Rice, 1 cup of chopped Arugula (or bitter green), 1/2 small Yellow Onion diced, 1 Carrot diced, 2 cloves of Garlic, 1 cup of frozen Green Peas that are thawed, 1/2 cup of sliced Green Onions, and Chinese 5-Spice Powder. Start off by prepping all of your veggies. As a result of doing this, it makes putting together the 5-Spice Fried Rice much faster! 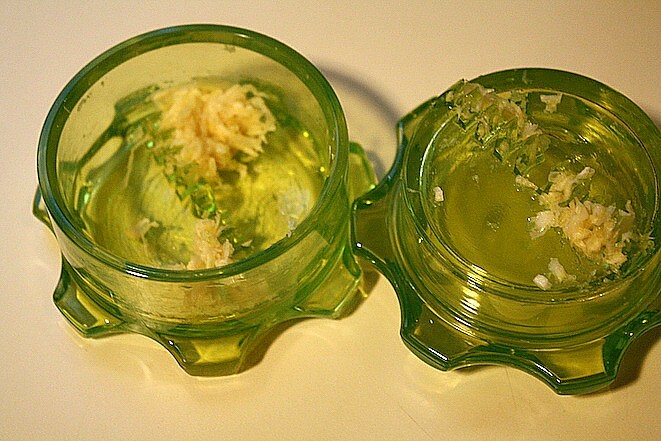 All I had left was to mince the garlic. Simply remove the skins, cut off the ends and mince away. 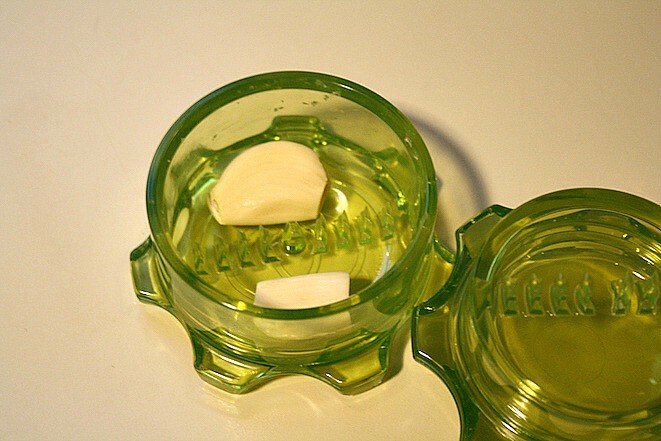 Here’s the finished garlic. Yum! 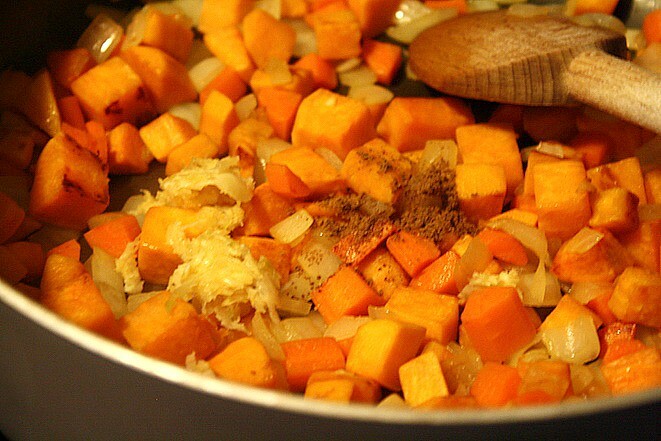 Once the oil is hot, add the chopped sweet potatoes. 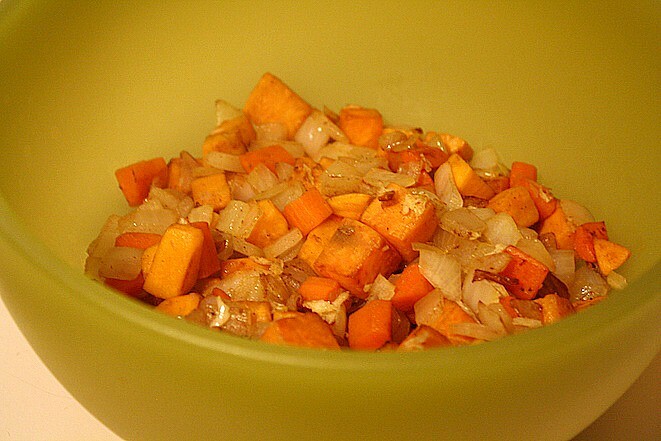 Stir frequently until the potatoes are starting to get tender and are browning on a couple of sides. It’ll probably take about 5-8 minutes. 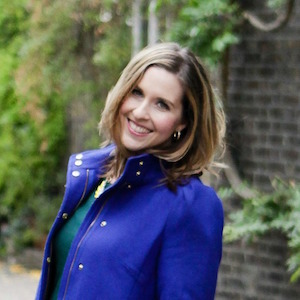 This is what you’re going for…see the bits of brown on some of these? 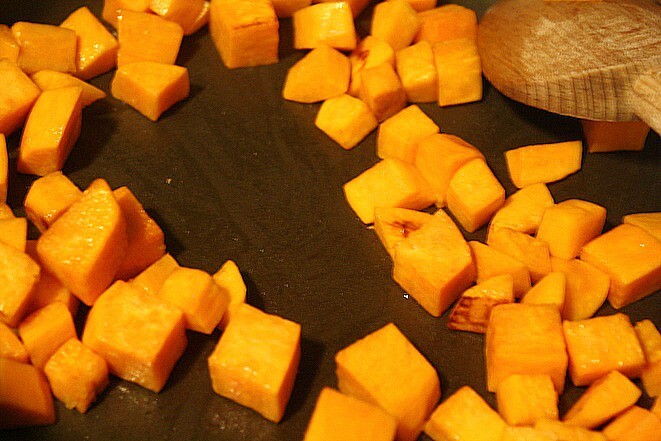 While they cook, test the potatoes with a paring knife to make sure they are starting to get tender. Add the carrots and onions to the pan and stir for another 3 minutes or so until the onions are translucent. Then add the minced garlic and 1/4 teaspoon of 5-spice powder to the pan. Then stir until it’s well combined. Transfer the cooked veggies to a bowl and wipe out the skillet/wok. 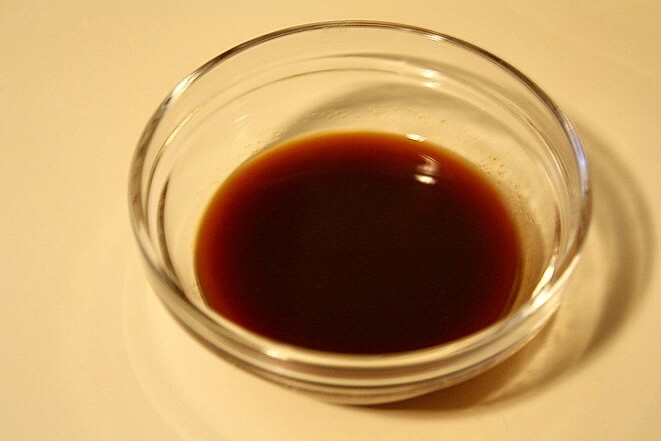 In a small bowl add 1 1/2 tablespoons of soy sauce, 1 tablespoon of rice vinegar, and 1 teaspoon of Sriracha. Then whisk it until it’s well combined. 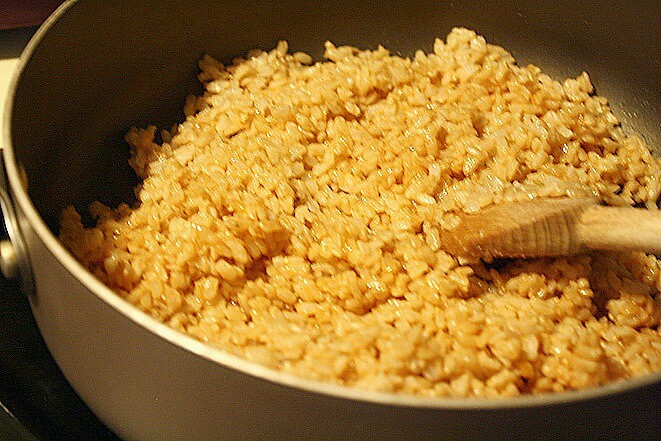 Once the oil is hot, add the 4 cups of cooked rice and stir for about 3 minutes, so that the rice is heated through. Then drizzle the sauce over the rice. Add the cooked veggies back to the pan. Stir away for maybe a minute or so until all of the ingredients are combined and heated them through. Finally add the peas, green onions, and chopped arugula to the pan. 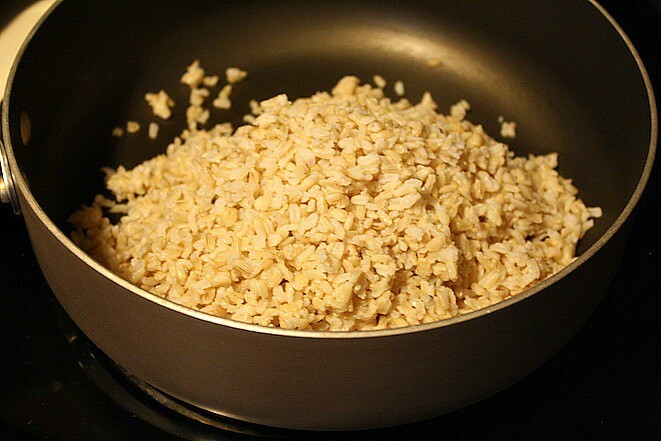 Stir the 5-Spice Fried Rice until it’s completely combined. You’ll remove the pan from the heat and serve it right away. In addition, I liked my rice with a tiny sprinkle of sea salt or a little drizzle of soy sauce to add a bit more seasoning to it. Hope you enjoy and happy stir frying!! 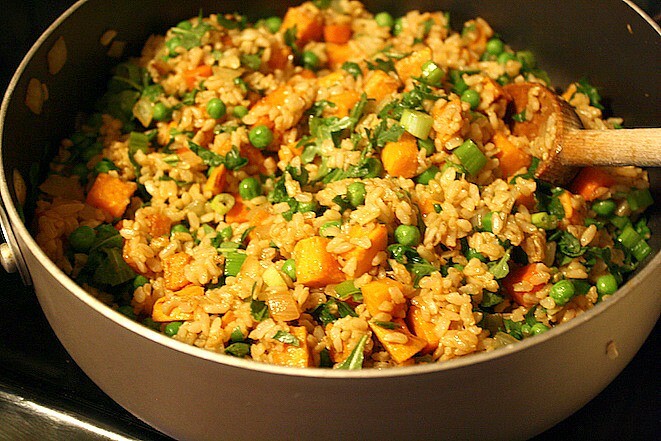 This is a healthy, plant-based recipe for fried rice, and it's packed with veggies and tons of wonderful flavors! First of all, cook your brown rice ahead of time. 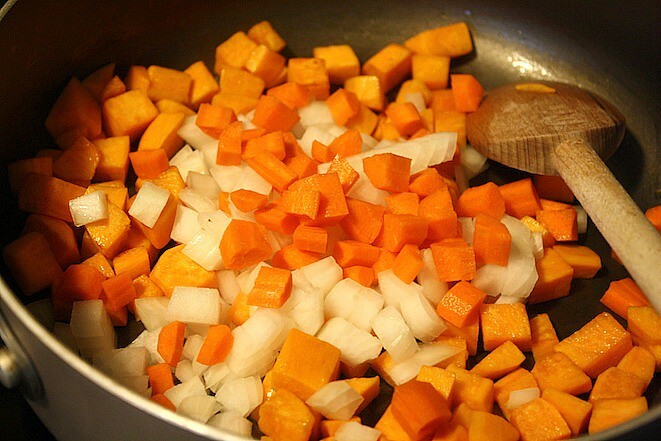 Then prep and chop all of your veggies including the sweet potato, onion, carrot, garlic, green onions, and bitter greens. 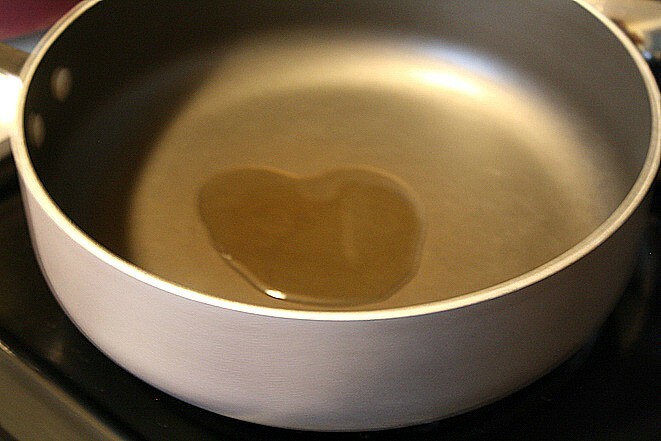 Heat a non-stick skillet or wok over medium heat, and add a teaspoon of oil to the pan. 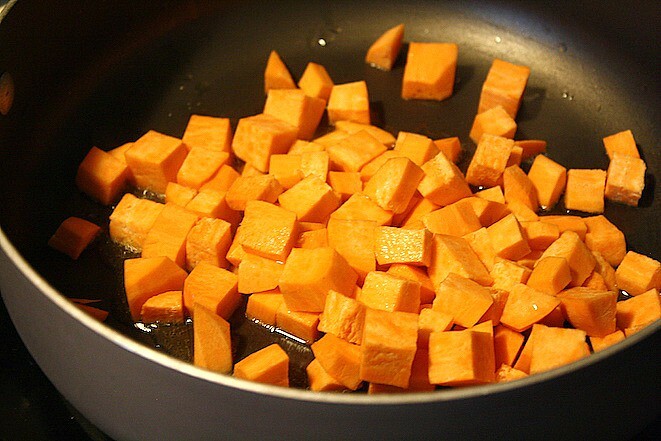 Once it’s hot, add the sweet potato and 2 tablespoons of water. Stir often for 5 to 8 minutes until the potato is starting to be tender and browning on a couple of sides. If the pan gets dry, add more water. Once the potatoes are tender and starting to brown, add the onion and carrots and cook another 3 minutes or until the onions are translucent. While the veggies continue to cook, add the 5-spice powder and garlic to the veggies and stir to mix well. Then remove the veggies from the pan and wipe out the pan. 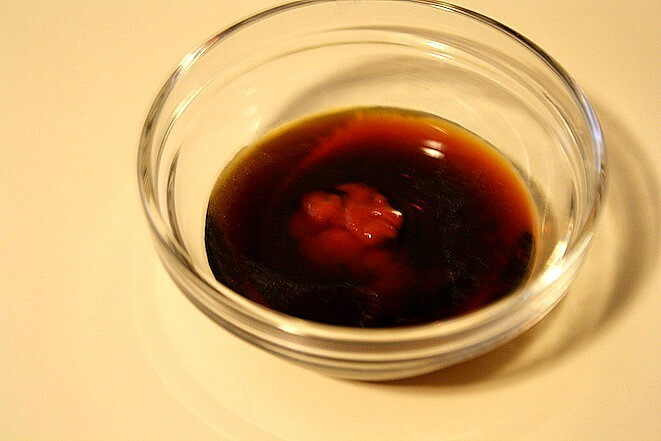 In a small bowl, combine the soy sauce, vinegar, and Sriracha and whisk well. 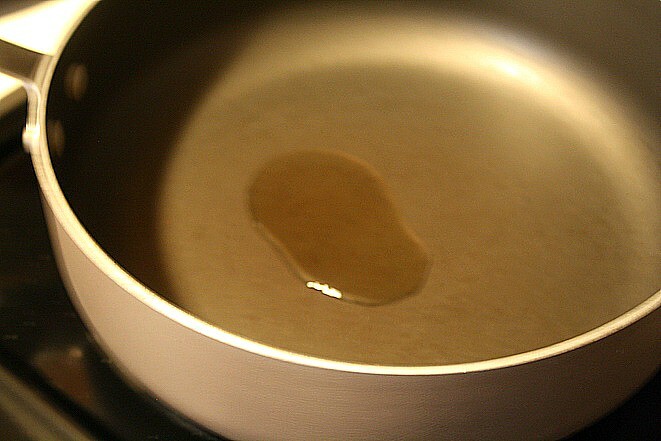 In the same nonstick pan, heat over medium heat and add the other teaspoon of oil. Stir fry the brown rice in the pan for 3 to 5 minutes to heat the rice. 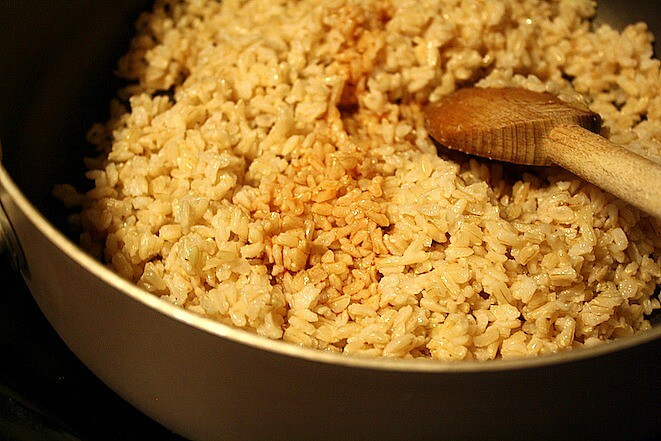 The sauce is added to the rice, and stir it well to ensure the rice is coated with the sauce. 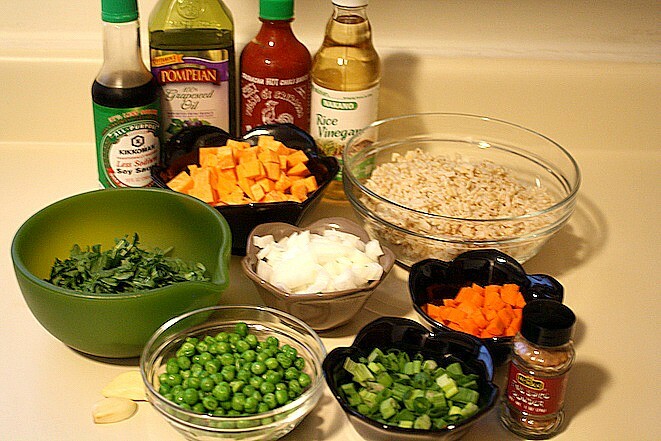 Add the cooked vegetables to the rice, and stir fry for a minute until everything is combined. 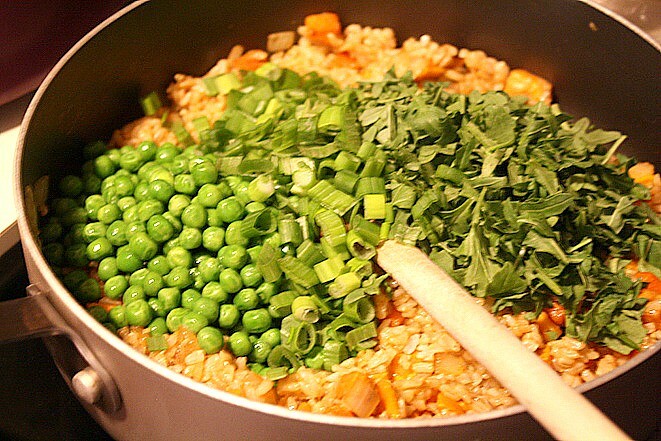 Finally, add the greens, peas, and green onions to the pan and fold into the rice mixture. Remove from the heat and serve right away. You can top with a tiny sprinkle of sea salt or soy sauce if you want a little more flavor. Enjoy!! I’ve read this recipe in the TK cookbook and have seen reproduced versions on a ton of different sites. The first step always has oil being put in a pan followed by potato’s with water. I don’t think it’s a misprint. When I added water to the pan it seems to help steam the potatoes slightly, so I think that’s why that step includes water. Hope that helps!